This is a nearly 10 mile paved bicycle and running path that starts 3 miles south of San Jose and continues south into the hills of Los Gatos. There are options to run on either side of the creek in parts (west side paved, east side unpaved). There are mile markers. 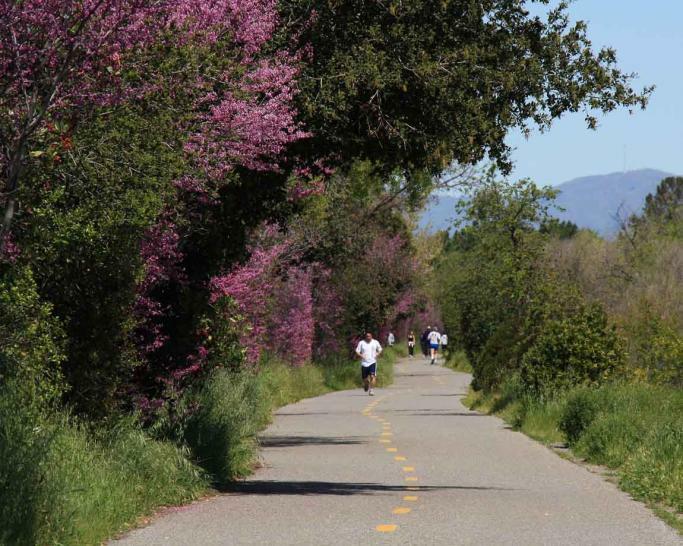 From north to south, the trail runs through Campbell Park (3 blocks from downtown Cambpell), Los Gatos Creek Park, Vascona Lake Park, and downtown Los Gatos, and then travels 3 miles gently into the hills, ending at Lexington Reservoir/Dam. It’s a gradual 500 foot climb from north to south. At the southern end, there are connections to the Flume Trail (unpaved) and to Novitiate Park and the St. Joseph’s Hill. Hello my friend! I want to say that this post is awesome, nice written and include approximately all important infos. I’d like to look extra posts like this . Wow, awesome weblog layout! How lengthy have you ever been running a blog for? you made running a blog look easy. The total glance of your site is wonderful, as well as the content material! Your means of explaining everything in this article is truly pleasant, all can effortlessly know it, Thanks a lot.